There are many factors that affect your ability to lower cholesterol. Not all of them are within your control. Age is one such factor that affects cholesterol levels and over which we have no control. However, with diet and exercise, even older people can lower cholesterol. Men and women are not created equally when it comes to cholesterol. Women, in general, before reaching menopause have lower cholesterol than men their same. An exception to this is found in women with a strong family history of high cholesterol. As women increase in age, their blood cholesterol also increases. Then, by about the age of 60 most women’s cholesterol readings level off to be comparable with men the same age. Finally, women over 65-70 usually have lower cholesterol levels than men of the same age. The hormone, HGH or Human Growth Hormone, is released by the pituitary gland in all people, even in adults who have finished growing. It is released in a short burst of only about 20 seconds each night as we sleep. As we age, the amount of HGH released decreases, and this has an impact on our cholesterol levels. HGH can reduce the amount of Low Density Lipoprotein (LDL) or bad cholesterol. With less HGH made by the body, cholesterol levels tend to rise along with aging. You can combat the affects of aging on lower cholesterol by eating right and exercising. These habits are especially important in maintaining the vitality of youth and in keeping cholesterol levels as low as possible. If you are concerned about your cholesterol at any age it is important to eat a low cholesterol, low fat diet. You can lower cholesterol without prescription drugs and reverse the impact of aging on your cholesterol. 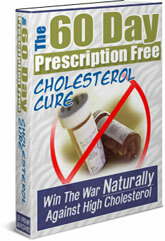 The way to do it is found in The 60 Day Prescription Free Cholesterol Cure.